The Stratford Eagles Composite Squadron is a member of the Connecticut Wing Western Region, supporting the USAF Civil Air Patrol missions. CAP is a non-profit organization and the official auxiliary of the United States Air Force whose three missions are Cadet Programs, Emergency Services, and Aerospace Education. All meetings are open to the public. Parents, visitors, prospective cadet and senior members are always welcome to attend. Members of the squadron consist of both Cadets (members ages 12-21) and Senior Members (members ages 18+). The members of the Stratford Eagles Squadron invite you to be our guest for an evening at one of our weekly squadron meetings. You will be given a tour by one of our squadron members during our regular meeting activities and answer any questions you might have about the CAP. Parents of potential cadets are also given information during this time. You may arrive any time after 6:45pm on any Thursday evening for your welcoming and tour. Please see the directions page for the location of our squadron. There will be a cadet at the gate to allow you entry into the area. If you arrive after 7:15pm, you may call (203) 377-5003 for gate entry. Meetings last until about 9:15pm and you may remain for the full meeting. Before joining, the squadron requires prospective cadets to attend at least three meetings. This ensures that you understand the commitment you are making, and get a feel for what the program is about. While we welcome pilots, you don't have to be a pilot to join. CAP offers many avenues of volunteer service, including emergency services, training and mentoring for cadets, and aerospace education. Thank you for your interest in the Stratford Eagles Squadron ! 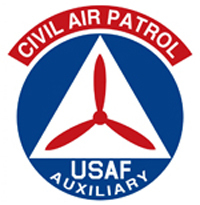 Civil Air Patrol’s 56,000 members nationwide also perform homeland security, disaster relief and drug interdiction missions at the request of federal, state and local agencies. Its members play a leading role in aerospace education and serve as mentors to more than 24,000 young people currently participating in the CAP cadet program. Performing missions for America for the past 75 years, CAP received the Congressional Gold Medal in 2014 in honor of the heroic efforts of its World War II veterans.